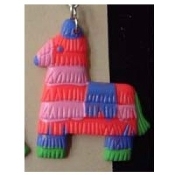 PINATA NECKLACE - Donkey Burro Mexican Fiesta Birthday Party Mexico Festival Charm Costume Jewelry - Colorful, plastic charm approx. 1-5/8" Diameter on 18" Neck Chain. Great Party Favors!